Watch out for our Classical Arched Wood Burning Insert Fire at the Ideal Home show 2013! Home » Blog » Posts » News & Updates » Stovax wood burning fireplace on display at the Ideal Home Show! The spectacular home maker’s show of the year is now taking place at Earls Court in London. Until 1st April, the Ideal Home Show is dedicated to homeowners looking for inspirational and fabulous ideas for their own homes. From your outdoor space to your interior decor, there is something for everyone. If you are a self-builder wanting to design a tailored look for your home, this is a place to meet all the industry experts. Otherwise, if you generally want to improve the outlook of your home, this is certainly the show to gather those stylish top tip ideas! 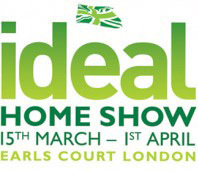 This year our Stovax Classical Arched Insert wood burning fireplace in Victorian Corbel Antique White Marbel is displayed at the Ideal Home magazine stand (IH2), which is the first stand that you will see as you walk through the main entrance. The stand set is styled by top London-based interior stylist, Sophie Robinson. So, why not take a peek, you never know this wood burning fireplace could be the one that you have been looking for! This classic insert wood burning fireplace is an icon of timeless design and is ideal, inserted into a chimney opening measuring approximately 36” x 36” (915 x 915mm) or larger. Its elegant and understated lines can be complemented by either the cleaner look of a contemporary mantel or the charming decorative detail of an Adam, Regency or beautiful stone mantel. With spring coming, now is the time to visit the Ideal home show for an insight into this year’s latest trends. Before you know it, you will be enjoying planning and adding these fantastic ideas to your home in the warmer weather to come. If you want to find out more about the Stovax Classical Arched Insert fireplace, visit your local Stovax retailer.